It's getting to be a sad state of affairs when gearmongers are putting more thought into women's gear then into men's. Whatever happened to "shrink it and pink it?" But there you are: MSR's women's Lightning Axis women's snowshoes are thoughtfully engineered from the ground up for the SheFlogger in your life. The narrow and lower-profile frame is designed for a woman's narrower and shallower gait, to prevent the dreaded hitch in their giddy-up. All-new for 2011, the women's Axis (men's version available too) sits between the vertically oriented Ascent and the flatlander Flash models. Where most other snowshoes use a tubular frame, MSR's made-in-America Lightning 360 technology uses a vertical piece of hard-care aluminum cut with a water jet that lets the frame be the traction. We can vouch: even on icy sidehills the toothed Lightning frame grabs securely. The wrap-around frames support a nylon deck and are joined by two cross members, also toothed, under heel and ball of foot. Two big beaver-tooth crampon points pivot with the toes, and because they don't form a static box shape they do a great job of preventing balling. Because if there's one thing you don't want while snowshoeing, it's balling. Seriously. Safety first! The new SpeedLock binding is a rare combination of simplicity and flexibility. Simple because it uses a one-pull elastic-strap-over-tooth system for the heel and instep straps, and a very clever wide-band set-it-and-forget-it toe strap up front. Flexible because you can remove the instep strap if you're on moderate terrain, and you can adjust the toe-in and toe-out up to 8 degrees for the pigeon-toed and duck-footed among us. When you hit the steep stuff, use the handle of your trekking poles to flip up the heel lifters, and you've got a few inches of relief from calf fatigue. The Axis is a mere 3lb 12oz for a pair of 22 inchers, designed for up to 180lb. A 25 inch length is available for up to 210lb (remember, she's carrying gear here...). Need more float? No problem, for just over 9oz you can snap a pair of tails on. They're designed to increase floatation by a third, and with a little practice they snap right on without removing your shoes. For the additional weight you get a nice bit of extra bounce. Since our SheFlogger is preggers, I expect these will get more and more use as a much-needed counterbalance, especially since she knows she's not supposed to be shredding the steeps this season. I don't know what it is about these Swedes, but they seem to be spawning outdoor gear like rabid teenage reindeer. Case in point: Lundhags, based in Jarpen (drive north from Stockholm until you hit Hudiksvall...) has a full line of clothing, packs and footwear. But what you really want to check out is... a whole new sport! Nordic skating is what we're talking about: clip into a pair of these fighter-jet looking skates as easily as Nordic skis - they use the same bindings - and you're in no time you're plowing through snow and over bumpy terrain that mere hockey skates would choke on. The secret is a wider and longer skate that floats and glides much better than skinny skates. Look out lakes and streams. I tried Lundhags' Delta skate with Rottefella BC binding and the X-Arc waterproof synthetic boot and I am now a true believer. Skating over a frozen lagoon was no problem. Watching the SheFlogger panting behind me at twice the effort on her recreational skates was just a bonus; the Lundhags are warm, stable and the free heel makes for a much more natural stride. I've saved the best part for last: there's nothing better than walking right up to the ice in the X-Arcs, setting down your skates and just clipping in. You're ready to go while everyone else is still whining about their hockey laces. Just try it. If you have boots and bindings all you'll need are the pre-drilled blades. The conventional wisdom says gear can't be both lightweight and durable. Northern Lites proves the conventional wisdom is smoking the wrong end of the crack pipe. 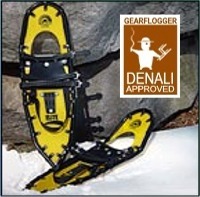 Their Elite snowshoes weigh only 36oz. for the pair and still look brand new after a long winter of use. These shoes performed flawlessly under heavy loads on Denali's Kahiltna Glacier, where you can get away with a smaller shoe like this on the well-packed trail during the climbing season. Their claim to fame is being three-time winners in the grueling 100-mile Iditashoe snowshoe race. For deep powder you'll want more surface area for better flotation, but for glacier travel, hardpack or fast and light these shoes rule.